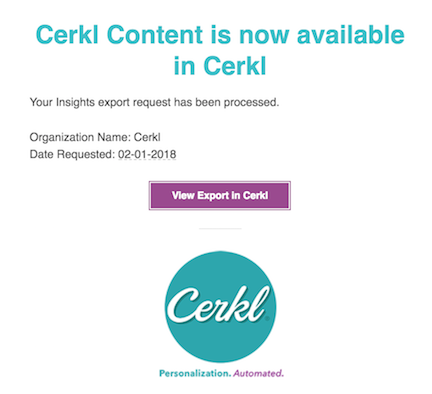 Want to export your data from Cerkl? You can export your data in a flash with Insights. 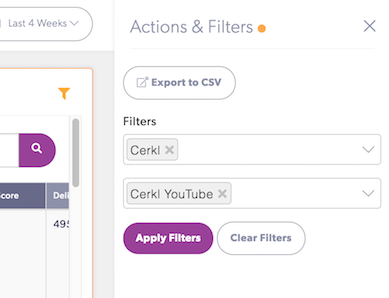 Here is what you can export: Campaigns, Content Performance, Audience, Delivery Metrics, and more. Any table in Insights can be exported as a CSV file. Select Insights. Go to the Dashboard for your desired data. For example, if you want to download your audience, select "Audience". Adjust the Reporting Period. You will see only data from the timeframe you select. If you wanted to gather your entire list, select All Time. If you wanted to export data from your campaigns in the past month, select Last 4 Weeks. Sort and order the list. The export will retain any sorting and ordering you add. Select the filter icon in the right corner of the table. You will see a menu appear on the left. Select the Export to CSV button. A pop-up message will appear confirming your export. You can click the button to see the Export. Please note there is a short delay in your exports being processed. The export will go from Pending to Completed in a couple of minutes. You will receive an email when your export file is ready to be downloaded or you can follow along on the Exports page. 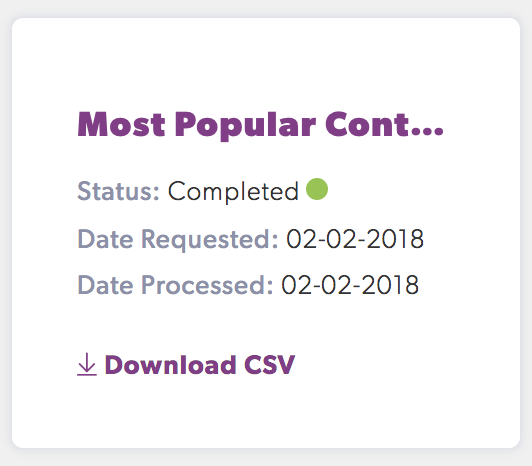 When your export says "Status: Completed", you can download the CSV file. CSV files can be opened in Microsoft Excel, Google Sheets, and other analysis softwares.